The requirements to earn a PhD vary from country to country and even from school to school, but usually, individuals earning this degree must complete a dissertation. A dissertation is essentially a long research paper or bundled published articles describing research that was conducted as a part of the candidate’s doctoral training. In Canada and the United States, a dissertation generally has to be defended before a committee of expert reviewers before the degree is conferred (see Figure 16). Once someone earns her PhD, she may seek a faculty appointment at a college or university. Being on the faculty of a college or university often involves dividing time between teaching, research, and service to the institution and profession. The amount of time spent on each of these primary responsibilities varies dramatically from school to school, and it is not uncommon for faculty to move from place to place in search of the best personal fit among various academic environments. The previous section detailed some of the major areas that are commonly represented in psychology departments around the country; thus, depending on the training received, an individual could be anything from a biological psychologist to a clinical psychologist in an academic setting (see Figure 17). Figure 17. 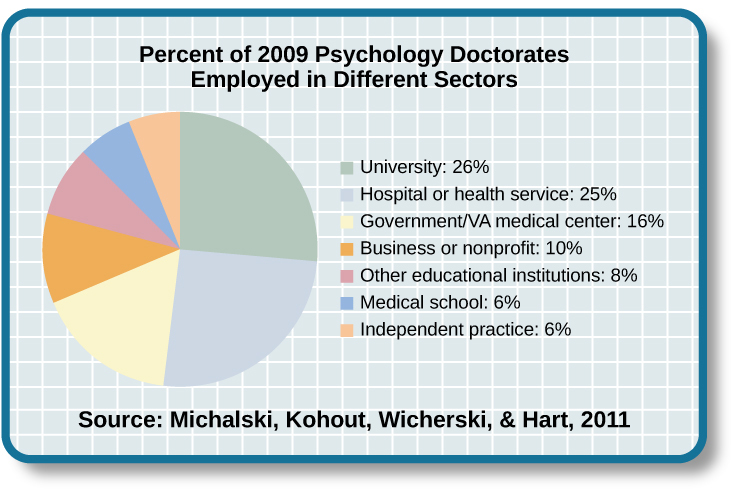 Individuals earning a PhD in psychology have a range of employment options. Individuals who wish to become practicing clinical psychologists have another option for earning a doctoral degree, which is known as a PsyD. A PsyD is a doctor of psychology degree that is increasingly popular among individuals interested in pursuing careers in clinical psychology. PsyD programs generally place less emphasis on research-oriented skills and focus more on application of psychological principles in the clinical context (Norcorss & Castle, 2002). Individuals earning a PhD can work in a variety of settings, depending on their areas of specialization. For example, someone trained as a biopsychologist might work in a pharmaceutical company to help test the efficacy of a new drug. Someone with a clinical background might become a forensic psychologist and work within the legal system to make recommendations during criminal trials and parole hearings, or serve as an expert in a court case. While earning a doctoral degree in psychology is a lengthy process, usually taking between 5–6 years of graduate study (DeAngelis, 2010), there are a number of careers that can be attained with a master’s degree in psychology. People who wish to provide psychotherapy can become licensed to serve as various types of professional counsellors (Hoffman, 2012). 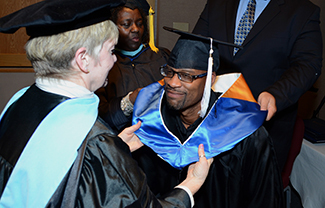 Relevant master’s degrees are also sufficient for individuals seeking careers as school psychologists (National Association of School Psychologists, n.d.), in some capacities related to sport psychology (American Psychological Association, 2014), or as consultants in various industrial settings (Landers, 2011, June 14). Undergraduate coursework in psychology may be applicable to other careers such as psychiatric social work or psychiatric nursing, where assessments and therapy may be a part of the job. As mentioned in the opening section of this chapter, an undergraduate education in psychology is associated with a knowledge base and skill set that many employers find quite attractive. It should come as no surprise, then, that individuals earning bachelor’s degrees in psychology find themselves in a number of different careers, as shown in Table 1. Examples of a few such careers can involve serving as case managers, working in sales, working in human resource departments, and teaching in high schools. The rapidly growing realm of healthcare professions is another field in which an education in psychology is helpful and sometimes required. For example, the Medical College Admission Test (MCAT) exam that people must take to be admitted to medical school now includes a section on the psychological foundations of behaviour. Careers in Psychology by Rajiv Jhangiani, Ph.D. is licensed under a Creative Commons Attribution 4.0 International License, except where otherwise noted.